Some of the Magic novels mention in passing that planeswalkers have a vague, hard-to-define feeling when they look at someone else who has a spark. I can’t help but wonder if this means the Rector here does, too. Not everyone who has a spark becomes a planeswalker, after all; but then again, you do exile her when she goes to the graveyard, and conceptually, we’re not sure exactly where the exile zone is . . . This card is obviously a riff on Academy Rector from Urza’s Destiny, and I’m honestly not sure which one is crazier. Is a steel-jawed prison more frightening than a super-accelerated Nicol Bolas? Is it more demoralizing to be one sacrifice outlet away from an animated Parallax Wave, or one sacrifice outlet away from a fourth Gideon variant to join the herd of Gideons that’s attacking you? 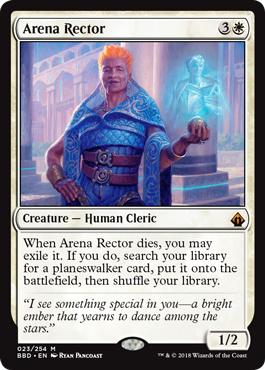 And since planeswalkers are not going to be any less the face of Magic in the months and years to come, Arena Rector is only going to get better. Once upon a time, back in the infamous Urza’s Saga block, there was a little card called Academy Rector. He seemed innocuous, a four-mana 1/2 with a death trigger that let you dig out any enchantment from your library and put it into play for free. As a result, Academy Rector became a piece to many a horrifying combo deck, thanks to being able to get out any part of the enchantment combo and being on a body basically meant to die. The reason I mention all of this is because Arena Rector is a very clear homage to Academy Rector. The one difference is that Arena Rector fetches planeswalkers, which is a notable difference. All the same, though, being able to tutor out Karn, Elspeth, Ugin, Jace 2.0, or a Nicol Bolas for four mana is a very low price to pay, especially with sacrifice outlets. She’s one of those creatures that begs for a way to break her open, and I feel like there’s a real chance she makes Legacy weep for mercy. Useless in Limited, but potentially amazing outside of it.